Why not the lemongrass? Even though imafan says hers grow to 8 FEET in Hawaii, they will be stunted when grown in small containers and like all grass,can be trimmed/mowed as needed. They generate lemony scent when brushed against and wind stirred against objects (which may help to repel bugs -- I crush and rub on my arms and legs during the summer), and trimmings can be used in teas and infuse unscented shampoos and liquid soaps. I actually throw a bunch of clippings on the patio as strewing herbs along with mint. As imafan also mentioned in the lemongrass thread,they CAN give you a nasty paper cut, so that's another reason to keep them clipped and upright, not trailing within reach of your toddler, though I doubt you'd let the child on the balcony alone. 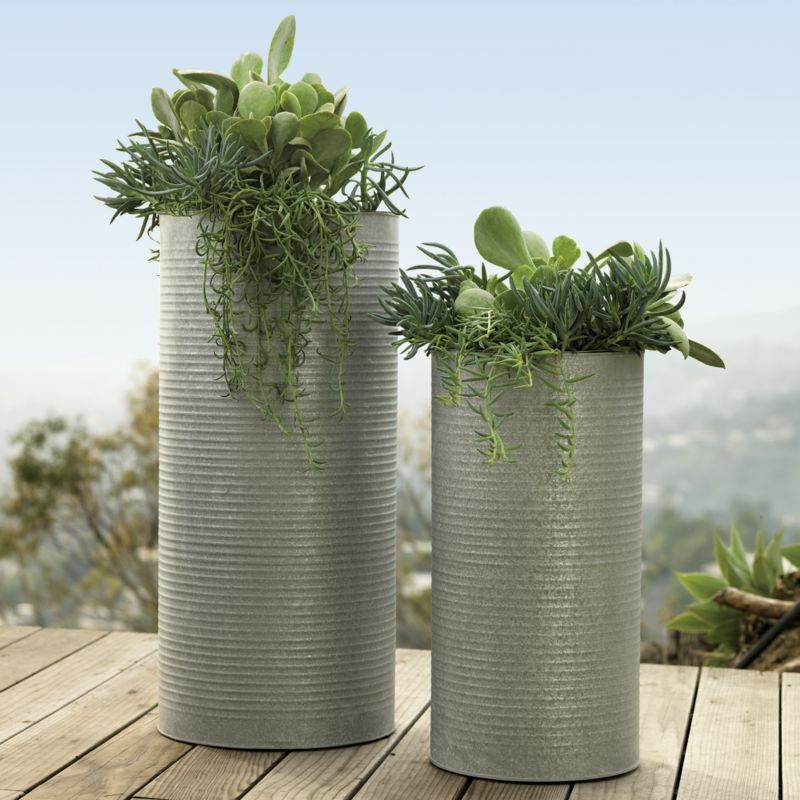 Realize that in pots and especially small containers, most plants will need to be either repotted, divided, or outgrow the container and need to be potted up, or they will die. Plants are living things, they don't stay the same, they will get bigger, they will lean, they will need water, fertilizer, root space, and eventually all of them will die. If you like the wheat grass, just plant the wheat grass. Annuals in small containers are probably a good choice. thanks guys. Im looking into the lemon grass. You say wheatgrass is annual. What exactly does that mean? That means it has a genetically programmed in life cycle - grow, bloom, set seed, die - all within one growing season. If you keep it trimmed and don't let it bloom or set seed, it will last longer, but it still gets pretty tired after awhile. So I planted some wheatgrass, it looked cool for the first two weeks and then it just started going all over the place and looked overly messy. Now its spring again and I'm looking for something to grow in the 6 planters I have. I was thinking of doing succulents but after seeing the pricing I think I'll stay away for now. It would cost hundreds of dollars to fill up 6 containers even though they are somewhat small. I was researching full sun ferns but I didn't see any varieties that made me jump. Planting manly plants is difficult. I'm now researching the macho fern ... LOL. 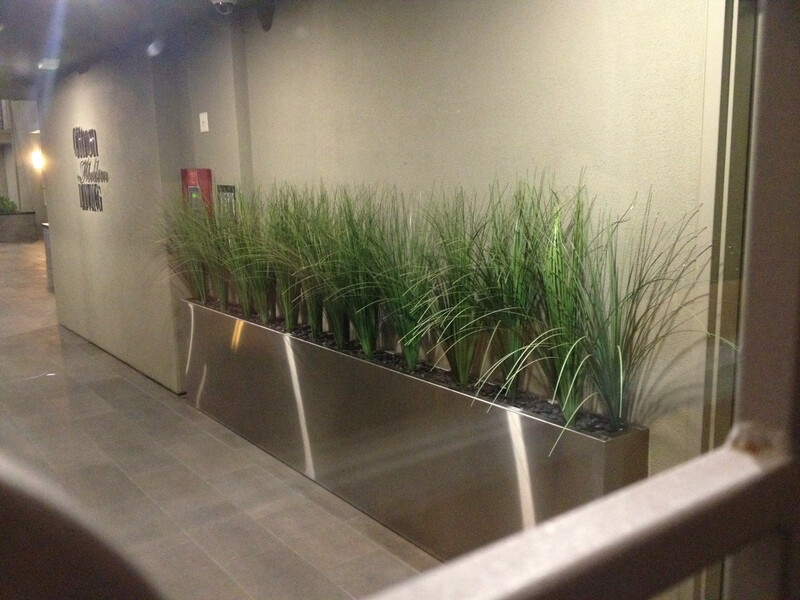 Also, the metal planters (seen above) don't have any drain holes in the bottom. Should I drill 2 or three medium holes on the bottom so that the water can drain? You have to have drainage. Two choices, drill the holes as you suggested. Or leave the planters as is, but empty the soil out of them. Put down a good layer of pebbles in the bottom, then put regular flower pots inside them and plant in to those, using your planters just as cache pots. this planter is also being used with cache pots. You might try this link. www.greatplantpicks.org They are interesting and have been trialed carefully. Also, go on line and look at seed and flower catalogs - they will put 'new' or 'rare' by the name. Find stuff that you do not see in neighbor gardens but be sure to do your homework and check your growing zone - I suggest using the Sunset chart because it divides the zones much more specifically than the USA general zone charts. Have fun with your garden and please post photos of the stuff that you did decide to plant. hmmm .... just went back and looked at the first page of this, which I hadn't seen for a long time. At that point you were talking about wanting a mixed planting with cascading stuff. That doesn't quite fit to me with the idea of modern, "macho," architectural stuff, but they are your planters. Anyway that means I went off on the wrong tangent. Anyway the snake plant, while perennial and easy care, is not at all cold tolerant and would have to be brought in for the winter. 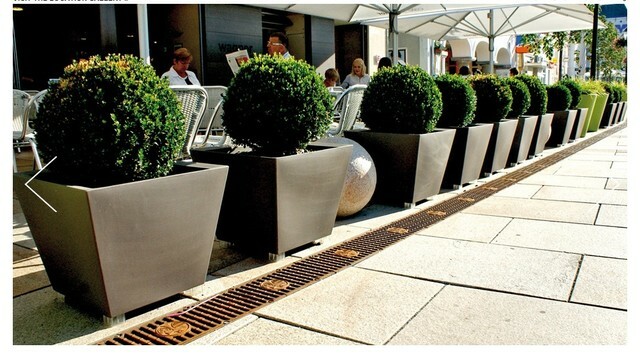 I still think the using them as cache pots with smaller flower pots inside may help you achieve the look you want as well as dealing with the drainage issue. Did you ever tell us where you are? I saw "east coast" but that covers a lot of territory. What cold hardiness zone are you in? I'm in Los Angeles. I think drilling holes might be the best option, since they are hanging onto the side of a rail I don't wont to weigh them down too much with rocks. I will look into your suggestions. I know a want more of a modern look but at this point I just want to get something green in them as my place is on a busy road and they have been without plants for months now. I like this arraignment because it has a few succulents but it also has a creeping/cascading plant, is that rosemary? They do look like Rosemary. BTW -- Succulents are easy to propagate from "cuttings" -- leaves, branch pieces, pupsâ€¢offshoots, etc. See if there are any plant sales in your area. I usually see at least one table of wide variety of succulents -- mostly just rooted tiny plants, and they are sometimes slow growing, but you can always group them until they need more space. I even saw an interesting one at the dentists office and asked for a few cuttings. It's taken a couple of years for this particular, unusual variety -- but they are growing well now. I saw some blue fescue at the Home Depot yesterday and it looked really cool in person. It also meets a lot of my requirements. It can take full sun, its not sharp so my 4 year old wont get his eye poked out and it doesnt take much water. If I can find a deal on it some where then I will go with it. The ones at home depot were $8 each so 3 of those per planter times 6 equals $144. Not going to happen. It is not rosemary in the planter. The leaves are too far apart and it is too fleshy. It is probably some other kind of succulent. Prostrate rosemary would work as a substitute. It would be thicker and darker green with small blue flowers in summer. I am trying to follow this post and I have a few questions. I searched this forum and pretty much all sources link back to you. If you could, please define your acronyms. What exactly do you mean by a 'Modern' plant? Are we talking GMOs (Genetically Modified Organism), or has god released something new I haven't heard of yet or do you mean something that your neighbors don't have yet? Also, did you know purple is the color of royalty, both Kings and Queens?